Innovation Roundtable: Is Silicon Valley Betting Too Much On PR Hype? 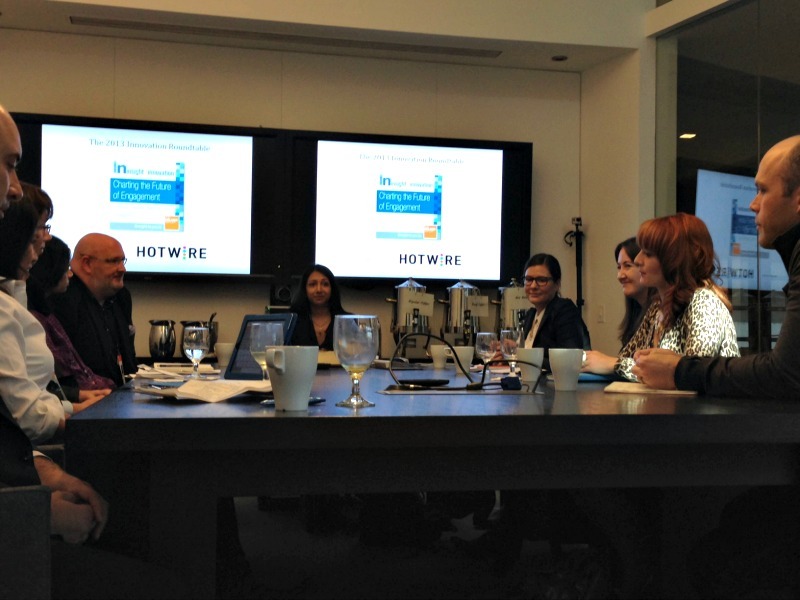 Home Latest Innovation Roundtable: Is Silicon Valley Betting Too Much On PR Hype? Eight senior comms professionals gathered in San Francisco to share insights on how innovation impacts their sector. Within the tech sector, the word "innovation" has morphed into a polarizing moniker that can mean so much – and so little – at once. Now with the word being stretched to, not only encompass technical advances, but also the evolution and disruption of entire business models, it’s practically become an unavoidable catchphrase for upheaval and progress. The Holmes Report’s In2 partnered with Hotwire PR to take a closer look at innovation – and ultimately what it means for influence and engagement. To do this, eight senior-level marketing and communications professionals gathered in San Francisco to share insights on how innovation impacts their sector. The conversation ranged from mulling the word “innovation” to considering how our own sector has advanced its strategic priorities and tactics, as well as the role social enterprise is playing in helping companies to forge stronger identities. Not only is the word "innovation" provocative, but its very definition remains elusive. But ultimately most companies apply to word to new features that, in their eyes, solve a market problem. ​ Jones: I started with Palm in 1999 – the company that disrupted and created a marketplace for smartphones. So, this backdrop shapes my point of view and I do believe in innovation. From a comms perspective, it is a very noisy world. But I’ve seen a shift in the role consumers play in really defining disruptive technology. Now more than ever – and Yelp has really pioneered this – consumers are opinion makers. In my Palm days, the Golden Goose was getting that Walt Mossberg review. That’s changed quite a bit and now it’s consumers really championing your brand and creating fandom around your product. O’Brien: One reason people feel that term is overused or played out is innovation itself doesn’t have a strict social definition. Everyone is defining innovation on their own terms. What maybe innovative to you, may not be innovative to me. [caption id="attachment_1291" align="alignright" width="239"] (Lto R) Averill, O'Brien[/caption] I think we’re very quick to add the innovation tag to anything we think is new or different or hot – but it’s really the consumers that give you the buy-in. And a lot of people refer to the Silicon Valley bubble and how we’re the most technologically connected community in the world. But are we always making sure what we’re building is scalable and sustainable to the outside market? Dainas: We do a lot to try and tell those customer stories and talk about innovation through the customer. For example, the National Health System in the UK uses video collaboration to provide diagnosis for strokes in way that can be life-saving. This is an example where the innovation is in how the technology is being used. 'It’s all about packaging in a way that solves a consumer problem.' Bhuta: As an organization, we try to convey usefulness to the consumer. A browser is a very basic form of technology, it used to be innovative 15 or 20 years ago. But now everyone uses it everyday. So, it’s all about packaging it in a way that it solves a consumer problem. We had this Coast by Opera launch, which is a browser for the iPad. It’s different in the sense that it doesn’t have any buttons – it’s all swipe and gesture based. We knew the whole idea was pretty revolutionary, it’s something that consumers can use and notice they’re doing something differently. So we packaged it in a way to say- yes, there is innovation here, but it’s about doing less and keeping it simple. Santiago: My background comes from the newspaper industry and the reason it has struggled is it failed to innovate. So I see this more about survival and have very warm feelings towards the word. It’s a must and it’s a must for all industries to constantly figure out how to apply technologies to keep in front of their audience. Averill: The key thing is to make sure you have something innovative to talk about. BitTorrent is tough for people to get their heads around, but it turns out that PRISM and the NSA gave us an opportunity. We have a strong belief in user control and privacy and we also believe we shouldn’t be building so high on these server stacks. So that was our billboard campaign. We went out there with a statement about what we don’t believe in: the NSA should own your data. This stopped people in their tracks and made them think a bit. And then we unveiled that after a weeks, you should own your data by BitTorrent. 'The word rings false with our community.' Walsh: I’m going to be cynical about the term. We don’t use it much at Wikipedia or Wikimedia. It’s not that innovation isn’t unfolding or that it’s not critical – but it rings false with our community. So, we have to be very careful on how we use it. The reality is, from an engineering and social perspective, you're solving a lot of problems that are insanely complicated. So anything you do to solve them is going to be in the business of innovation. The challenge from a communications perspective is to tell small parts of that story so that we can create some perspectives on computer science, social and philanthropy. It’s like ‘skunk works’ to express what is going on without ever using the word. Managing executive expectations While marketers and PR pros might be sensitive to overusing the innovation moniker, often executives and engineers genuinely believe incremental product improvements are game-changers – and pushing back on this belief can be problematic on many fronts. Walsh: One of our great roles as communicators is to provide context about the genuine “innovation-ness” or newness. You don’t want to support a launch that’s nothing, but within an organization there’s a lot of emotion around “but this is what I’ve been working on for the past two years.” We just launched a visual editor for Wikipedia to simplify editing. It’s an initiative that’s hugely complex and our community has very strong feelings about it. They don’t want the interface to change. So that was hugely difficult to navigate. It was a lot of 'let’s talk about, let’s be transparent but let’s not put it at the center of our world.' Innovation Roundtable: Video with Wikipedia's Jay Walsh on brands and community O’Brien: Because I’m also very closely married to our product roadmap, I actually separate myself as much as I can so that I don’t go too native in thinking. I also pay contractors who will never be a part of our company because they will always see the forest for the trees. Also, it’s best to never give a flat out no. But instead say, here’s why this isn’t the best timing or maybe we need to package this with a group of other announcements about the direction the industry is moving in. Campisi: It’s been interesting to see the word ‘launch’ creep into this. Because from an agency perspective, we’re often faced with clients who think of the launch as ‘the thing,’ the moment when the PR magic will happen. O’Brien: No one understands what you really want is rolling coverage over several weeks. That’s an expectation I always try to set, especially at startups where a lot of people have engineering backgrounds and will say, 'today is launch day! Where are my articles?' There’s always a struggle with engineers and execs having unrealistic expectations and they say 'my PR team/comms team never does what I ask.' So, I keep a list of priorities and if someone says – 'I’d like you to drop everything and work on this release.' I can say: 'OK – which one, or five things, are you OK with not happening this week?' That makes people realize it’s a trade-off. But also, it’s our responsibility to know when you do come across a 'drop everything' thing. Averill: And now there are a lot of great channels that wouldn’t necessarily be a big comms push. You can do a blog post or a contributed article. [caption id="attachment_1292" align="aligncenter" width="264"] (L to R) Shah, Jones, Campisi[/caption] Defining the innovation narrative Silicon Valley tends to gravitate towards set narratives, like David vs. Goliath or the clash of the titans. Depending on the economic climate, sometimes the media focuses on monetization, and other points, the overarching theme is simply about disrupting the status quo. How do communicators gauge the media's appetite for certain storylines -- or break their own organizations out of a tired narrative? Dainas: David versus Goliath will always be a thing. [Polycom] competes against Cisco and we had a major launch last year with some really cool technology. But the fact that we were taking on Cisco is what drove a lot of the media interest. We had a browser-based video that was going to change the game. But it was the drama that got us on the business shows. Jones: Consumers driving fandom has caused a change a in the media landscape. We’re less about competing with other companies and more about competing for consumer time. There will always be that David versus Goliath story. But at Samsung we’re looking to build our brand around lifestyle. It’s less about, here’s how we’re different from the iPhone. So, our narrative had to change, which we did via partnerships in vertical categories like in sports. We also do a lot in SXSW to be culturally relevant. ‘Brands are often bigger celebrities than individuals.' Walsh: We explored celebrity around our fundraiser. But we found Wikipedia was the celebrity. Brands are often bigger celebrities than the individuals. A lot of electronic gadgets come to mind when you think about brands or executives being the celebrity – but not every company has that. With Wikipedia, we have spent no money trying to grow our brand, but we protect it and invest our resources in some of those fights. Dainas: [Polycom] was focusing a lot on the IT and tech buyers, which is because they are big buyers. But we were starting to see that people in other departments were contributing to sales. So, we launched a marketing campaign with social and press on defying distance. This was talking to users about how they use technology to bridge distance. It really broadened us beyond IT. Innovation Roundtable: Video with BitTorrent's Christian Averill on overcoming brand perception issues ‘In the 21st century, you’re transparent – even if you think you’re not.’ The Silicon Valley news cycle has long been defined by a hot trend – whether this is big data, cloud computing or the quantified self. Amid this, the concept of the social enterprise – or creating socially responsible, values-driven businesses – has taken hold. But the question remains – is this a fundamental shift in business or hype? Listerman: I see a trend towards Silicon Valley being seen as a political force. There’s all of this money being accumulated, all of these successful companies, all of these young people with ideas who claim they want to change the world. They launch new technology and they get people to stare at their palm. Does that really change the world? What’s the agenda? Walsh: In the age of Wikileaks and Eric Snowdon, if you don’t release information yourself, it will find a way out. Information wants to be free. And whether it’s social enterprise or CSR, we’re looking to see that companies take these things seriously. It’s essential that companies think about these things, map them out and be transparent – which means being open and ready to talk about them. Social enterprise just means running business well – being more mindful of your carbon footprint or your supply chain processes and not just making profit for your shareholder. I can’t imagine consumers will be less focused on that. And I hope the media keeps everyone accountable to that. But I think the media is getting softer on this and tech journalism is not talking about the issues that are important. Campisi: We see two streams of entrepreneurship. There’s the traditional, build it fast and stay up all night doing it. Then there’s the next wave of tech entrepreneurs who don’t consider themselves tech entrepreneurs. They’re harnessing technology to spur social change. This idea of innovation isn’t about the technology itself, but the behaviors that you’re able to use the technology to change. I feel like we’re in the place where we’ll see these worlds overlap. Averill: I think that’s the challenge of the media in general right now. It’s changed how it covers technology. They’re all competing with Gawker – these guys generated a model around link bait and everyone has to compete. Campisi: As PR people, we pay attention anytime Facebook, Microsoft or Apple even sniffles because we know there will be 50 tech reporters chasing that story who are looking to file something fast. So we prepare commentary around it, but it’s worthwhile to ask yourself – is it worthwhile? It’s great to ride the wave, but you have to ask if you’re contributing to the hype cycle. Dainas: But it’s not just about having a point of a view, it’s also about moving fast. When Yahoo talked about everyone coming into the office, [at Polycom] we obviously have technology that enables distributed work. So we jumped on this within in a day, but so many people had already jumped in. Many of these were people who had nothing to do with the topic. And it’s also about having a brand personality. Back in my Sun Microsystem days, we had products that weren’t the most exciting. But we had opinions on everything. I talked to reporters who covered Sun simply because they found us interesting and liked the personalities. ‘It’s all about understanding where content fits in the marketing funnel.’ What defined PR innovation in 2013 was content marketing. Some called this a repackaging of advertorials and other marketing collateral, others justified the innovation tag by pointing to the genuine shift in media revenue models and consumption habits. Nearly everyone, however, was ultimately interested in how content marketing impacted the bottom line. O’Brien: I look at content as being in different parts of the funnel. There's awareness, where you have social media or YouTube. Then there’s the stuff that moves you down to where your product is actually being considered, like demos and articles more specific to you. Then closer to the bottom of the funnel, your audience needs to understand all the ways to use your product. This is where case studies and testimonials matter. Dainas: You have to remember, a lot of reporters moved in-house and became content machines. And now they create great content. [At Polycom], we look at how content fits into different parts of the funnel. And we’re now showing the business impact. ‘Likes’ are great, but if you can show demand generation through social – that’s powerful. Then you can show how content is not just about generating awareness. Jones: We have many, many channels for our consumers and retail is one. One channel isn’t mutually exclusive to another. And the lines start to blur – did this person first engage with us on social and that got them in the door at retail? But overall, the theme is about being relevant at the right time and the right place.